That’s Not a Window Seat! 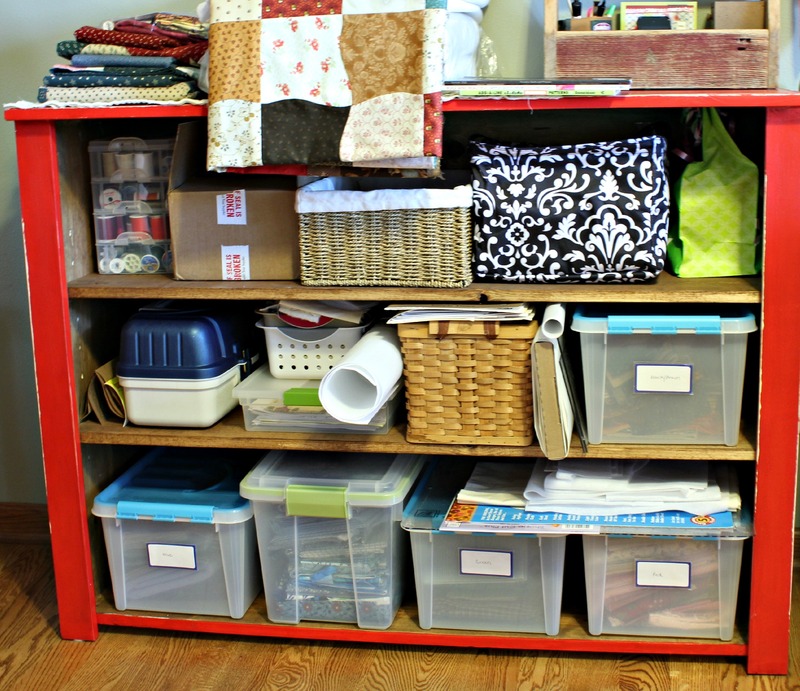 I’ve always thought my sewing room lacks adequate storage. Not everyone agrees. Some people would say the problem is not a question of storage, it’s a matter of owning too much stuff. If you’re a quilter then you know that one can never have too much fabric. Agreeing to disagree, on this matter, brings that discussion to a conclusion. Now, on to the declared problem at hand . . . additional storage. Since my room is not very large I’ve hesitated to purchase additional furniture. Any storage I were to add would have to make the most of its footprint. Searching for just the right application took me in many directions, most of which proved fruitless. On one occasion I was cruising through a home improvement magazine, not looking for anything in particular, when I happened to find a picture of a window seat. The photo grabbed my attention. Instantly an idea came to mind . . . this could be the answer to my storage dilemma. In my sewing room is a wonderful bank of windows, three in total, that would beautifully showcase a window seat. The window seat could serve two purposes. It could obviously provide a place to stash my sewing projects as well as provide a wonderful spot to relax and watch the world go by. This just had to be my mission. Finding the picture was the first step. The second and, not so easy step, was convincing my husband that he should make it. I tore the picture from the magazine and presented it to my husband. I explained my intentions and waited for his reply. The reply was not an instant one. As is his custom, a period of pondering was required. I left the picture in his possession hoping that it wouldn’t get lost and that he would decide to construct my window seat. Days passed. Weeks passed. I watched the torn magazine page collect dust on my husband’s dresser. Periodically I gently reminded him about the window seat. He did agree that it was a viable option. The only problem was there were no “how to” directions for construction. My husband cruised the internet looking for plans that might be similar and eventually presented a set for my approval. Carefully we both analyzed the dimensions. The more we pondered the attainable outcome, the more we convinced ourselves the window seat, although very glamorous, just wasn’t going to fill my ultimate need for storage. The window seat idea was placed on the back burner for the time being. Fast forward several months to a trip we made to Cyndy’s Country Cottage in Rockton. This has been one of my favorite resources for primitive furnishings. Several pieces of my furniture have been purchased from her establishment. I don’t even remember exactly why we had made the trip to Rockton. What I do remember is a vintage looking red shelf. It had tell-tale signs of wear, which always catches my eye, and appeared to fill the dimensions we desired. I fell in love with the red cabinet, at first glance, but my cautious side told me to grab a few measurements and mull over the possible purchase. Both my husband and my son-in-law thought it was possible to recreate the unit and save money as well so we left Cyndy’s Country Cottage without the shelves. I never did purchase the red shelves from the Rockton store. Instead my husband hand-made me my very own set of shelves. The dimensions are just perfect for my needs. The vintage look was achieved through a special painting technique. The time it took from start to finish was lengthy. The amount of money saved by doing it ourselves was Zero. It actually ended up being quite pricey in comparison to the inspirational shelves in Rockton. The individual appeal of my very own, hand-crafted, custom designed red shelves . . . PRICELESS! See if you agree . . .
Organization is always key (hoarders not withstanding). As for a window seat…I’ve seen folks use this plan over at Ana White. I could spend hours over there!